Hangar 17 is Sacramentos first and only upscale dive bar! 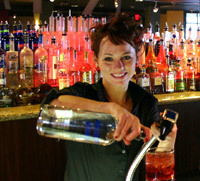 We have an upscale lounge environment, with a neighborhood bar attitude. Sit at our beautiful serpentine bar that highlights a colorful dining roomAll of your favorite sporting events will be featured on one of our large flat screen televisions, with the city’s longest happy hour (M-F, 2-7 pm)! Our moderately priced menu features California cuisine, highlighted by a wine list including many Napa Valley and California favorites. Some of our delicious dining specialties include Caribbean Chicken, Panko Crusted Prawns, Penne with Salmon in a tomato cream sauce, or a Pork Porterhouse stuffed with bacon, gouda and sage. Quench you thirst with any of our specialty drinks like a peach Mojito, Midtown Martini, or the ever-popular Hangar-tini!